Takahe is a flightless bird, endemic to New Zealand, which means it is only found in that area. This bird was thought to be extinct twice already, but a population of about 200 birds still lives in the mountain valleys of the Fiordland national park. The Takahe is a massive bird, reaching up to 65 cm in length and 3 kg in weight. They have a smooth, olive green coat and a bright red beak, which makes them very distinct among the birds of New Zealand. They have lost their ability to fly over the thousands of years they’ve lived on New Zealand, as they had no natural predators. As they are flightless, they have become excellent runners. Takahe live only in unreachable mountain valleys 1200 to 1800 metres above sea level in the Fiordland national park in New Zealand. Storms and snow blockages make these valley inaccessible for most land animals. The Takahe live in pairs and each pair needs a territory of about 3,5 square kilometres. The individuals try not to wander too far from their each other, keeping up a voice contact when they don’t see each other. These large birds feed mostly on mountain grass, that grows in dense patches in the valleys. If they have a choice, the Takahe will eat only new, fresh leaves and sprouts, that are rich in protein. When the snow comes, Takahes move move to lower areas, where they feed mostly on fern and forest grass, which is not as rich in foodstuff. Takahes form life-long pairs. The mating period lasts September through October. A pair then makes a nest in a patch of grass, weaving a dense nest, that shelters eggs from weather changes. One to two eggs are laid and after 27-29 days the chicks hatch. A day or two later they already leave the nest, but the parents still feed them for a few weeks, after which they become independent and start looking for their own partners. The Takahe lead very isolated lives and people see these birds so rarely that they have been thought to be extinct twice already. 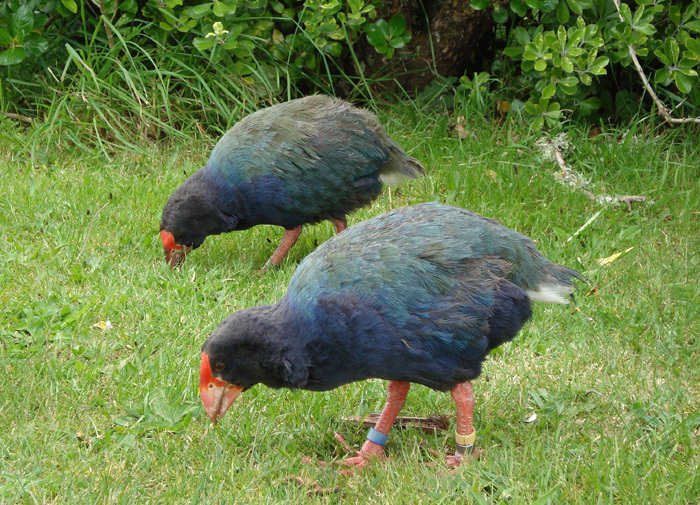 Europeans hadn’t seen these birds until 1849 when one Takahe was caught by hungry seal hunters. Then again the bird was not seen for many years, when in 1948 a few specimen were found in the Fiordland region. Currently, the Takahe are classified as “Endangered” by the IUCN red list of endangered species. 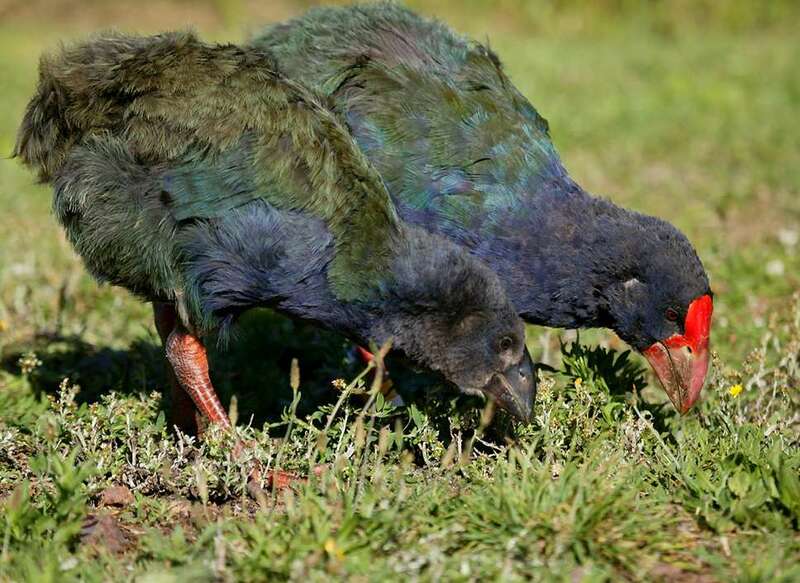 There are multiple possible reasons, while most scientists think it is because not enough food is available for the Takahe to maintain a steady reproduction. The population of these birds, however, is slowly increasing, as a result of New Zealand’s law enforcements, in regards to conserving this species.